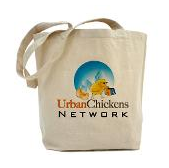 Urban Chickens Network blog: girls not yet roosting, right? The literature I've read all recommends that we teach the girls to start roosting while they're young ("young" being a relative term, I suppose). I tried a couple weeks back by putting a dowel across their cage, a couple inches off the floor, but no luck. Instead of roosting, they just huddle/sleep in the now-smaller-because-its-divided cage, occasionally looking at me as if to say "we used to have so much room! but this twig? why!?" After a couple nights of watching the dowel function as a poop-catcher instead of a foot-rest, I removed it. Tonight, I tried again with a much wider dowel. Again, a couple inches off the ground, and I even tried manually placing them on the dowel so that they'd be roosting. It worked! Until I closed the lid to the cage and then they happily hopped down and cheep-cheep-cheeped about displeased they were I'd once again divided up the cage space. This is frustrating to no end, as they seem to have no problem whatsoever "perching" for long periods of time on the side of the cage, or on the struts under the table outside or any other place besides inside their cage. In a week (once the Eglu comes), they'll be outside, and hopefully roosting instead of sleeping in their filth at the bottom of the coop. I decided to use the Google to help find an answer, and lo and behold, I think I've found the problem: the roost is too close to the ground. Chickens like to roost high up, and I'm trying to get them to roost knee-high (if chickens had knees). So, I'm keeping up hope that once they get outside, they'll begin to roost like good chickens should. Hi..what kind and how old are the chickens at this point? Hey Bossmare, we have two Barred Plymouth Rock hens, and at this point they're 15 months old. They still fight for the "right" to camp out in the nesting box overnight, but at least one of them roosts on the bars of the Eglu.